A wonderfully crafted story that brings a small Yorkshire town and one quirky matriarchal family who is known for adding a bit of magic and hope into every creation. 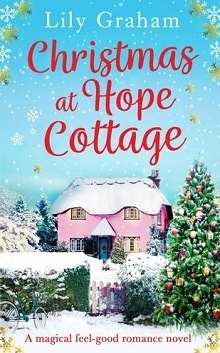 Emma Halloway moved to London for Uni – away from the grandmother and aunts and Hope Cottage with all of the expectations and burdens of family history that came with it. Before the age of 6, neither Emma nor her grandmother Evie knew of one another: Emma’s mother having married, left Whistling and redefined herself, leaving her history behind and Emma parentless when they perished in a car crash. So at 6, Emma was introduced to the magic that emanated from Hope Cottage, and in attending the local school, also felt the sting of ages old family feuds. Hope Cottage has been the Halloway home for at least two centuries, housing an ancient Aga stove, a kitchen garden and greenhouse full of herbs, and the women who use “The Book” to record recipes later used to fulfill hopes and dreams of those who come for help. While guaranteeing no promises, the recipes they create are said to repair relationships, improve health, luck, courage and more: buoyed up with the annual Good Cheer Christmas Cake that is believed to bring harmony to Whistling for the coming year. I’ve read a few stories with a similar premise: each special and magical in their own right – but here Graham brings the magic and change to Emma, one who wasn’t knowingly seeking answers. An accident on her bicycle left Emma in bad shape: beaten, bruised, no sense of smell or taste and scrambled vision, she returned to Hope Cottage to recover, worried about her own future and reeling from her breakup via Post-It Note from her long-term boyfriend. A freelance food writer that focused on the history of food – her hand and lack of eyesight are sure to be a hindrance, and her continued refusal to believe in the power of “The Book” and the sacrifices that have been paid over the years keep her morose and a bit snippy. But, even as she refuses to accept her history, the history and power of Hope Cottage haven’t forgotten her, and the slow healing combined with the solidity of family, old friends, the half-return of her first love and the on again off again warm relationship with her grandmother’s tenant have her understanding her own history and worth in the most unexpected ways. Full of gossip, laughter, struggles and redolent with the descriptions of scent, taste, and memories, this was a story that was a joy to read – total escape reading that is sure to leave you smiling and wondering about ginger snaps, lemon scones and shared cake. Lily Graham has been telling stories since she was a child, starting with her imaginary rabbit, Stephanus, and their adventures in the enchanted peach tree in her garden, which she envisioned as a magical portal to Enid Blyton’s Faraway Tree. She’s never really got out of the habit of making things up, and still thinks of Stephanus rather fondly.